People of all ages feel a spiritual hunger. They want to experience authentic community with others. They’re searching for meaning in their walk of faith. Look for St. Paul places where people can wrestle with questions and build relationships – then take the conversation out into their worlds. Women of the ELCA is a community of women who gather in thousands of Lutheran congregations. Together, women grow in faith and live that faith through ministry and action. Here at St. Paul, women of all ages gather each month for friendship, support for your faith journey, Bible study, and service. Men of the congregation gather for service, fellowship, and discussion, second Saturday morning of each month. The idea is to strengthen guys in Christian faith, relationships, and service. 2136 is a ministry for adults in their 20s and 30s to be social, to study, and to serve. Gather and learn with other young adults on the 1st and 3rd Thursdays of every month, 6-7:30 p.m. 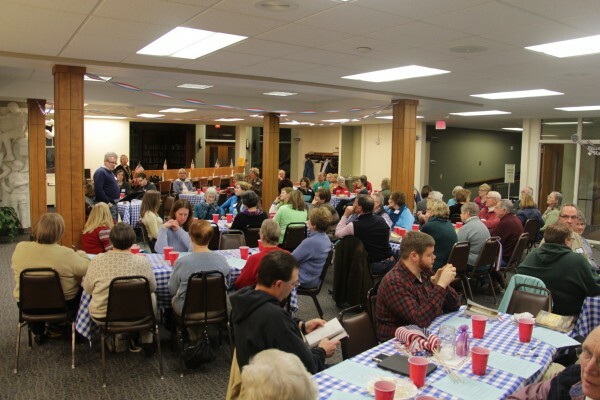 The group meets for Bible study, social and service events. To stay up to date on 2136 happenings, check out the 2136 Facebook Page. Gather with other local college students for times of faith and fun. If you are new to the Quad Cities or have been around your whole life, we’d love to get to know you. Grab some food and a beverage and settle in for an evening of faith-filled discussion. Held in the lower level of Front Street Brewery in Davenport, this group meets on the second Tuesday of the month, 7 p.m. This group brings together fun-loving folks who are age 50 and older. Sample such monthly gatherings as a hayride, local theater, progressive dinner, or a river excursion. This devoted group of caring quilters, beginners and experts alike, gather monthly to sew, tie, cut, and piece together beautiful works of art that are donated to those in need. Get out your needles and knit for others. No experience needed, come and learn! The KnitWits meet the third Thursday of the month at 5 p.m. Faith and spirit add up to joy throughout the year at St. Paul. Take a gathering of St. Paul people and you’ve got a setting for belonging and rejoicing. Golden Agers Worship and Luncheon: Senior adults, age 75 and above, renew friendships at this delight-filled event each October. All St. Paul Reads is an annual event in reading and community sponsored by the Book Corner in January. A great read, a room full of book-lovers, and an array of hearty soups create a warm evening. Mayfest is the annual outdoor celebration. We close off a portion of Lombard Street and spill into Vander Veer Park. A grill wagon turns out hundreds of sandwiches for the biggest potluck in town. A live band tunes up. There’s all sorts of fun for all ages.